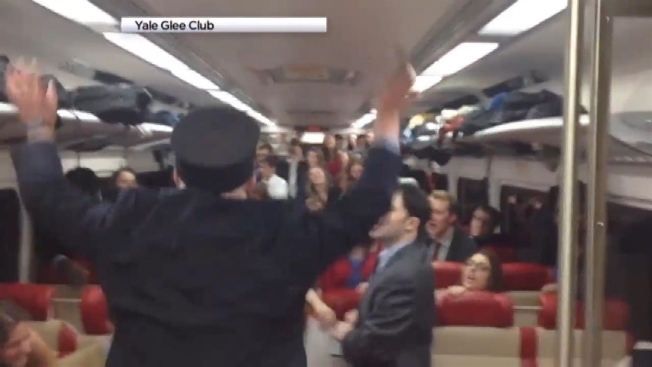 Dan Rubins, the Glee Club president, said the club was on a Metro-North train headed back to New Haven, Connecticut, from a concert at the Yale University Club in New York on Friday night. That's when conductor Bob McDonough asked them to sing. "I told them I was a conductor, so I must conduct... and somehow they bought it," McDonough wrote in a Facebook post featuring a video recorded by club member Greg Suralik. The group then breaks into the "Carol of the Bells," much to McDonough's delight. Rubins said the group also had McDonough as their conductor on the way to New York and had sung for him then. He said the Glee Club also performed for passengers waiting for their trains at Grand Central Station.